The Classer toolkit is offered in open-source format, and may be integrated into user's applications as needed, subject to CopyLeft licensing terms, as defined by the Free Software Foundation (see discussion here for example). As such, it is available free of charge, and may be copied, redistributed, or modified, as long as any resulting work is distributed under the same terms of Copyleft. To support integration of the Classer toolkit, its interfaces are specified by API (Application programmer's interface) documents, available here. The source code for Classer is provided as a zipped archivehere. Also included are solution and project files for loading the Classer source code in Microsoft Visual C++ .NET edition. 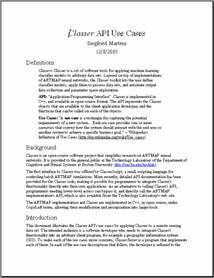 To simplify the job of getting started with the Classer API, a Use Cases document is available here. This document steps through a variety of the basic tasks a user might want to implement using the Classer API. 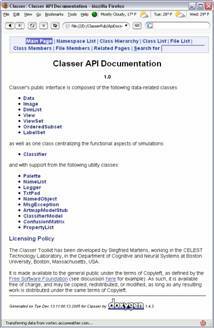 The ClasserTester code implements each of the use cases, using the Boston data set. The first time it runs, it has to run a relatively slow preprocessing use case; this only takes place on the first run. Subsequently, the stored results of preprocessing are used. A Visual C++ project file for compiling ClasserTester is available here. For lower-level access, the ARTMAP implementation at the core of Classer is available as a standalone module, with its own API documentation. Users who want to bypass the larger Classer framework and work directly with the ARTMAP module can find it here.